The Bedruthan Steps hotel and Spa is a personal favourite of mine. The views are sensational and many of my blogs have been written whilst nestled around the log fire in the tranquility room that overlooks the bay. Earlier this year I got to share this awesome venue with 10 guests on a retreat that I organised with my business partner Helen for our retreat company Ignite Life (I will save this write up for another post). Despite already being head over heels in love with this sanctuary space I hadn't yet had chance to check out the Sensory Spa Garden, an hour long experience designed to invigorate all of your senses. When I received an invite to check it out I simply couldn't wait. My mum was flying over from Spain for a quick visit whilst my dad was on safety boat duties for a sailing regatta out there. We'd already decided that this was going to be a pamper trip for her but I don't think she was quite expecting to be picked up from the airport and moments later be submerged in a sensory spa extravaganza. She wasn't complaining. 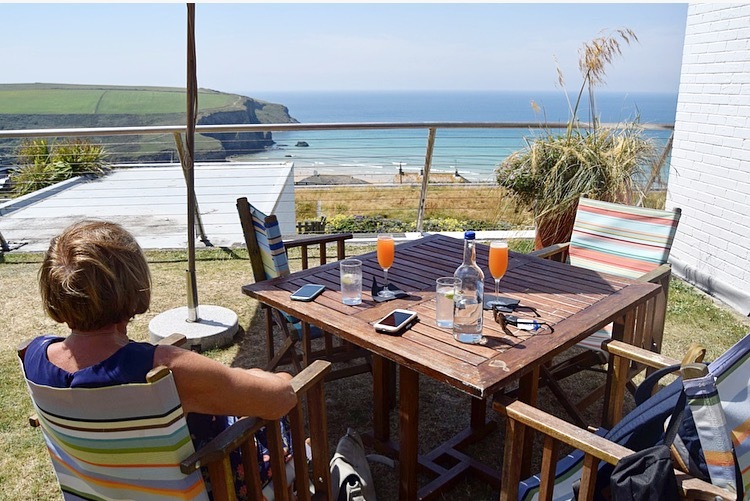 Within an hour of her getting off the plane we were sat on the terrace of the Bedruthan Steps hotel & spa, sipping Aperol Spitz and soaking in the nothing short of spectacular views. There wasn't a cloud in the sky and the sea was that wonderful bright turquoise colour that Cornwall sometimes puts on display when it's trying to kid you that you're in the Maldives. One thing that keeps drawing me back to the Bedruthan Steps Hotel & Spa is the relaxed atmosphere that you experience from the second you walk through the door. It's unpretentious and familiar style swoon you into leaving all of your stressors at the door. Exactly what you need on a spa day with the momma. Cocktails on the terrace was followed by a light lunch in the restaurant. We were lucky enough to nab a table right in front of the windows so the captivating landscape accompanied us throughout lunch. The food was a tapas style assortment of light bites that made you feel as full as you'd want to feel before heading into Spa. We opted to save dessert until after our spa experience and the restaurant was more than happy to accommodate this. As we headed down to the spa from the restaurant there were constant reminders of your proximity to the sea. The corridors are lined with beautiful artwork and abstract scenes inspired by the area around Mawgan Porth and carefully positioned port holes provided glimpses of the dramatic cliffs that shelter the bay. On arrival in the spa we were given some garden shoes, a robe, a towel and a wrap. After changing into our swim suits and donning our robes we were led up the steps and into the Garden spa. The Sensory Spa Garden focuses on indulging the senses. 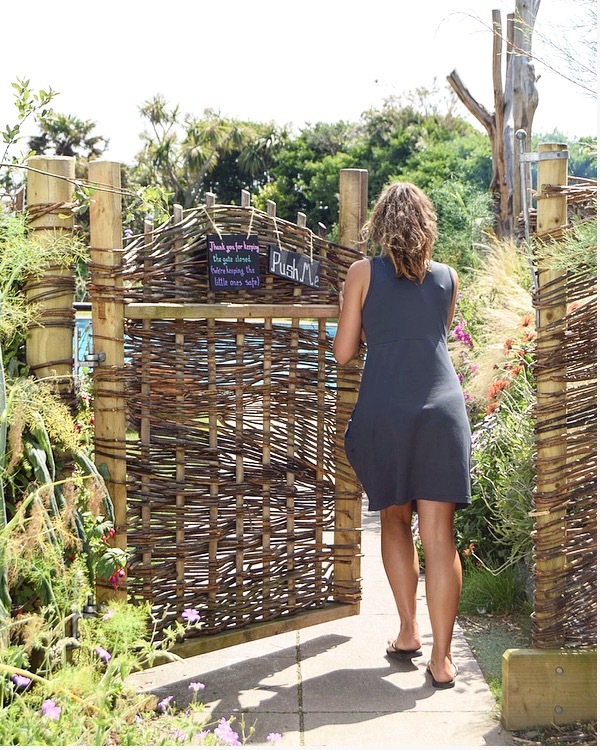 The sub tropical gardens don't just look pretty, they're also designed to give off ayurvedic aromas that enhance each of the seven stages that you walk yourself through in the garden. Nature bathing and thermotherapy are also key focuses in the garden. The first stage of the experience was a dry oat rub in the heated Cornish stone room. Mum and I covered ourselves in this soft exfoliating rub that was full of calendula petals, oats and other delightful ingredients that soothed the skin and brought healing properties to any inflammation. After covering our legs, arms, chest and face, we took it in turns to do each others backs before heading into the next stage. We turned the corner and was welcomed into a cedar sauna for the second stage. We sat here for 15mins with our body temperature quickly rising which promoted a deep sweating. This kind of deep sweating reduces the amount of lead, nickel, zinc & other chemicals in the body, which we know as toxins. 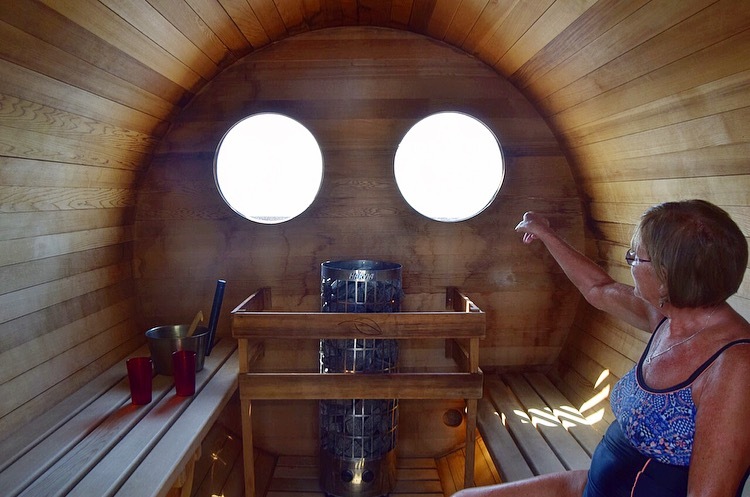 We rid ourselves of toxins, burnt calories and boosted our immune system all whilst peering through the port holes and admiring the view. I'd choose this kind of healthy living over a treadmill any day of the week! The third stage was a shocker, but surprisingly greatly appreciated. An ice cold bucket of water over the head. A key principal of thermotherapy is the application of hot and cold stimulus to the body with the purpose of changing the core temperatures of the soft tissue. Otherwise known as a 'contrast shower' the ice cold bucket of waters intention is to give the body a thermal shock. Not only does it strengthen the immune system, increase the metabolism and improve blood circulation but it also tightens the pours leaving you with pure and glowing skin. After i'd got over the initial shock I really did feel fabulous. I went back for seconds and then thirds. The third, fourth and fifth stages all took place in hot tubs and the aim was to slowly raise the body temperature again. Each of the three tubs was slightly hotter than the one previous which gave your body time to adjust after the thermal shock of the ice bucket. As we sat here catching up on life with each other the soft breeze from the atlantic blew through. I was feeling deeply relaxed at this point and I think one of the photos above has captured me having a brief snooze. On to the sixth stage which was a wet seaweed salt scrub and hot rain shower in another of their Cornish stone yurt styled buildings. I loved the little touches like the log leg rest and rain style showers, I'm definitely going to be using these as inspiration in my own garden when we finally get around to landscaping it. On to the final stage for a spot of nature bathing whilst appreciating the Earth, Wind, Fire, Water elements that the whole experience has been centred around. As we sat around a log fire with our feet in copper bowls of hot water, sipping on herbal tea, surrounded by wild aromatic flowers and staring up at a clear blue sky, you can forgive me for never wanting this experience to end. Mum and I began chatting about booking it for a family christmas experience as we realised that although we had completely lucked out with the weather on the day that we went, it would have been equally as enjoyable in the midst of a dark winters days. To top it all off we had access to the outdoor pool which given the weather we couldn't not indulge in. We spent an hour or so soaking up the rays on the sun loungers and taking the occasional dip in the pool before getting changed and heading back up to the restaurant to finish with our trio of desserts. We left the Bedruthan Steps hotel & Spa feeling deeply connected as mother and daughter and relaxed to our cores. This was my first experience in the sensory spa but it certainly won't be my last. We've now decided to include it as an optional extra on our retreat days. It really is that good. I can highly recommend this whole experience and strongly suggest you check it out. You can find all the details here Prices start at £55 per person which is an absolute steal in my opinion.